Tycho Sound Design is based around electronic musician/producer Ken Evans, who has been involved in creating, producing and recording electronic music since 1985. As a founding member of Australian synth pop band Tycho Brahe, Ken has written, produced and performed on five Tycho Brahe albums and a number of EPs and singles, has performed live across Australia, and has remixed other acts under the name Tycho Brahe. Tycho Sound Design is based out of Tycho Central, a studio in Brisbane, Australia, which houses Ken's considerable collection of synthesizers, drum machines, and recording equipment. Physical Synth Tracking: Send your existing MIDI sequence files to be run through a hardware synthesizer. Tycho Sound Design has a range of vintage and contemporary synths available, and CV/gate to MIDI converters to enable MIDI sequencing of pre-MIDI equipment, giving you access to an alternative sound palate if your soft synth or VST instrument isn't doing the job. Hardware synths can add warmth and depth to your project compared to "in the box" virtual/software synths. See the equipment list for available hardware; sound/patch design is included as part of a consultative process to get the sound that you want. Unless requested otherwise, files are typically supplied dry (no effects processing) in your specified file format, ready for mixing/processing by your mix engineer. Vintage Drum Machine Tracking/Programming: Send your MIDI files or audio drum files/demo drums to be re-created using a specific vintage drum machine, or even a mixture of different machines. Depending on the particular drum machine(s) involved, files may be supplied as either multitrack files, stereo mix, or mono, supplied dry (no effects processing) in your specified file format, ready for mixing/processing by your mix engineer. Custom Synth/Drum Sequences: Tycho Sound Design can supply original custom composed synthesizer or drum machine sequenced/programmed parts for your existing song, to add another level of production or atmosphere to your project, from ambient drones through to intricate complex patterns and arpeggios. Vintage '80s backing tracks: Tycho Sound Design specialises in reproducing synthesizer and drum machine parts for classic '80s songs, with full mix and production included if required, to an exacting professional standard virtually indistinguishable from the original commercially released recordings. Files can be supplied in your specified file format, as a stereo mix, individual tracks, or stems. Due to the demanding nature of this work, clients for this service are limited and very exclusive. Tycho Sound Design's current major client is Peter Hook (ex-New Order/Joy Division) for Peter Hook & The Light's ongoing "Substance" world tour (2016 - 2018), with full rebuilds of New Order's "Technique" and "Republic" albums currently in progress for a world tour scheduled beyond 2018. Occasional local Australian clients include Sydney '80s band, Machinations. Remix Service: Tycho Sound Design can remix your song utilising hardware synths and drum machines, with additional access to appropriate session players if required. Audio files can either be individually supplied dry in your specified file format accompanied by a rough reference mix, ready for final mixing/processing by your mix engineer, or as a final mix ready for mastering. 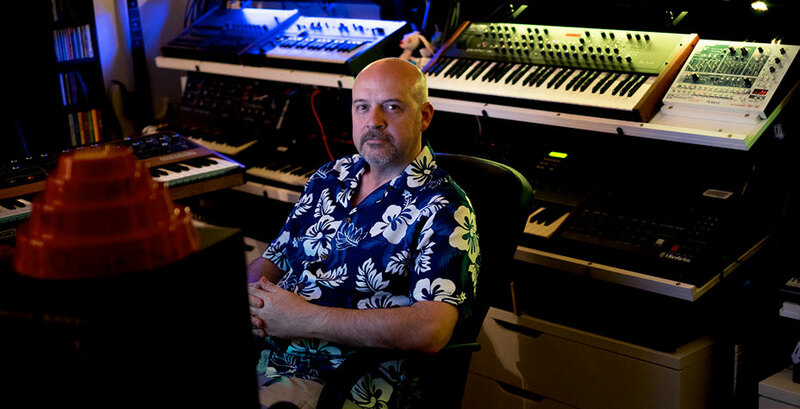 Emulating the style of famous '80s producers is also possible if desired - for example, previous projects have successfully emulated the styles of Giorgio Moroder, and Martin Rushent. People like Ken are rare in this business. He came along as a fan, then became a friend and is now a trusted colleague. His knowledge of electronic music and talent for programming is very natural. We now rely on him for the backbone of our sound...the backing tracks. His attention to detail, so vital to getting the real feel of the period when these tracks were made. Also the right sound and atmosphere that is also as important, not just for our enjoyment, but for the audience as well. So that all of us get the perfect experience. Without him our job would be ten times more difficult without a doubt.